So last year I was all about the Year in Chalk from Hands On Design ..I could not wait to stitch it (me and chalkboards) :) I didn't receive the chart until January was over so this is the first time it has been on display for the month of January..It is in a pedestal frame from Michael's..mounted on black gingham..and sits in the foyer.. The deer came from Cracker Barrel this year ..they are ornaments and I just tucked the string to hang them behind them..
Prairie Schooler Prairie Seasons Winter added to a grapevine wreath ..Love this wreath so much hanging on the kitchen hutch ..It doesn't hurt that I love everything in the cabinet behind the wreath either! 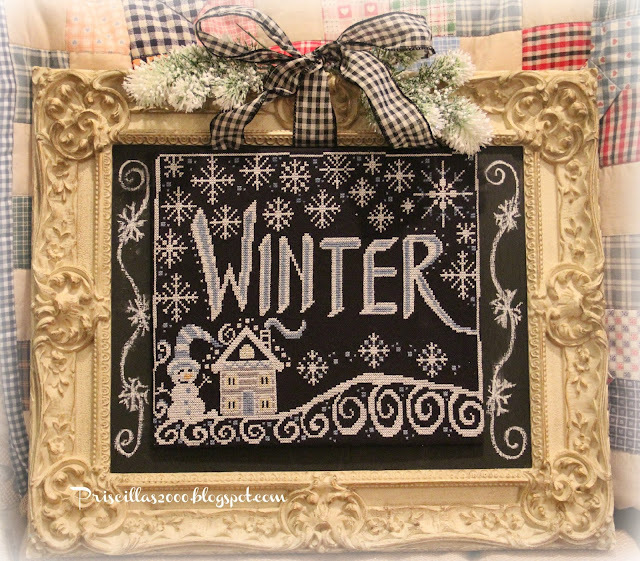 In the galvanized tiered tray there is a little ornament from a Just Cross Stitch older ornament issue .. not sure if its Little House or Country Cottage Needleworks..And the Seasons in Chalk Winter (Hands On Design and Me from the current Just Cross Stitch Magazine) hangs on the dining room wall ..
Another piece in the foyer is Snow Sampler from Country Cottage Needleworks.. 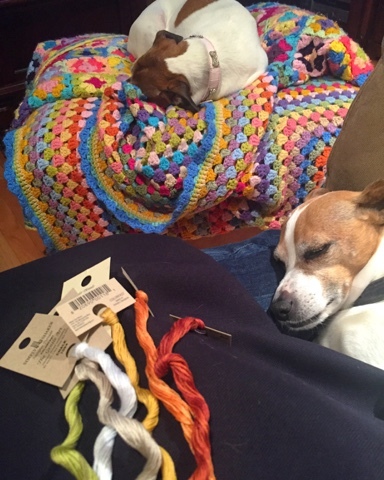 Pretty soon it will be time to bring out the Spring stitching! 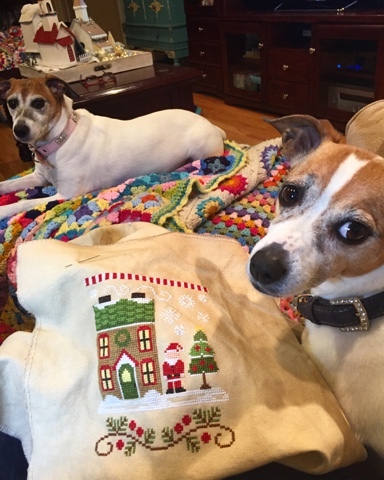 So that's it for today ..Ronnie and Reagan say Hi ! 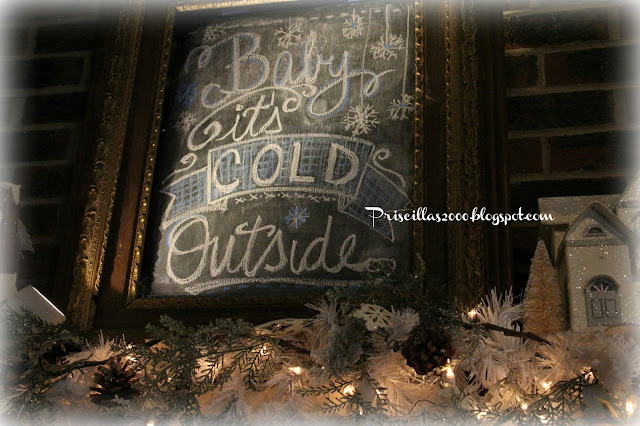 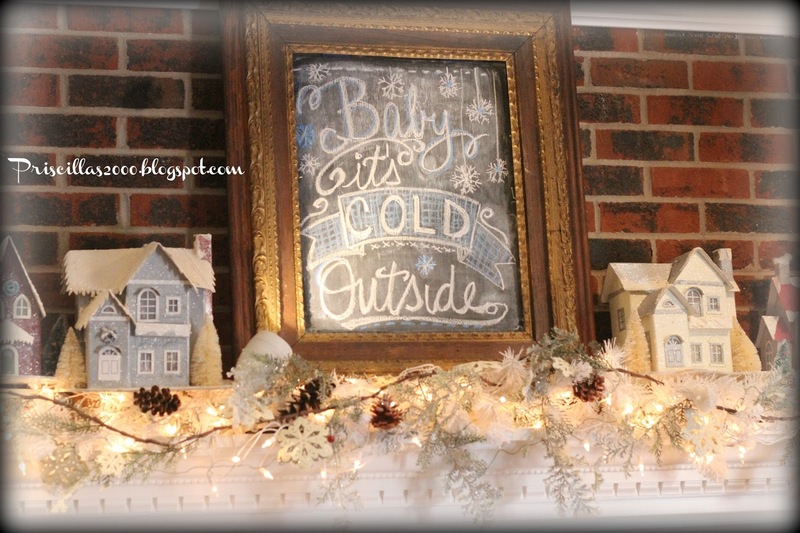 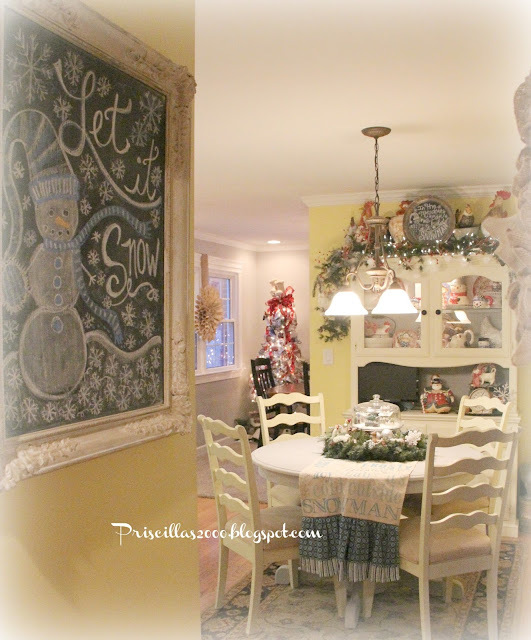 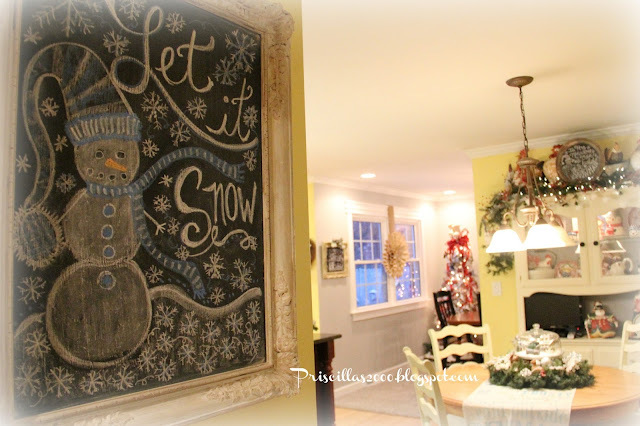 I have shown you bits and pieces of the kitchen decorated for Winter ..and I am putting all those together here..
Of course the seasonal chalkboard ..one of my favorite decorations! 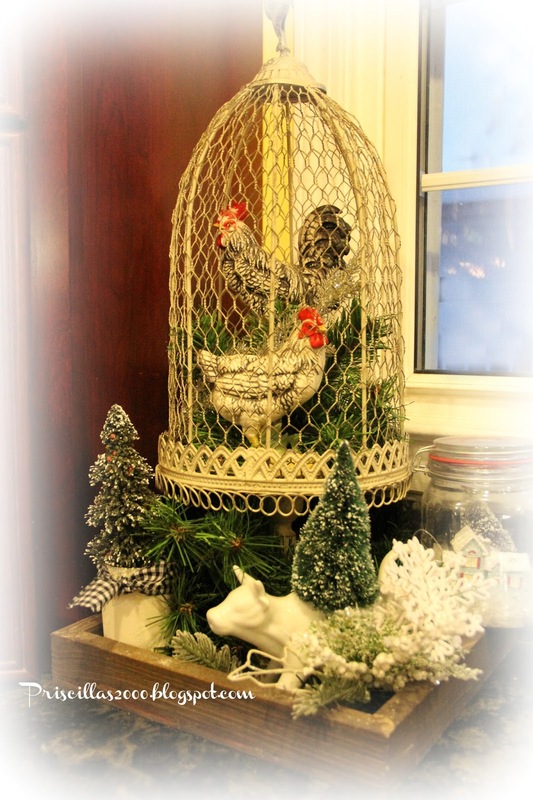 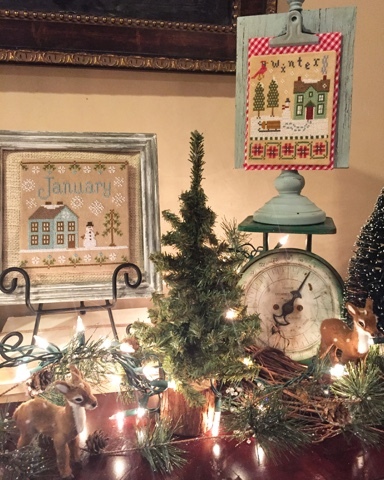 This vignette has a couple vintage chickens in a cloche ..mason jars, another cow creamer snowflakes, greenery and bottle brush trees in a wooden tray.. 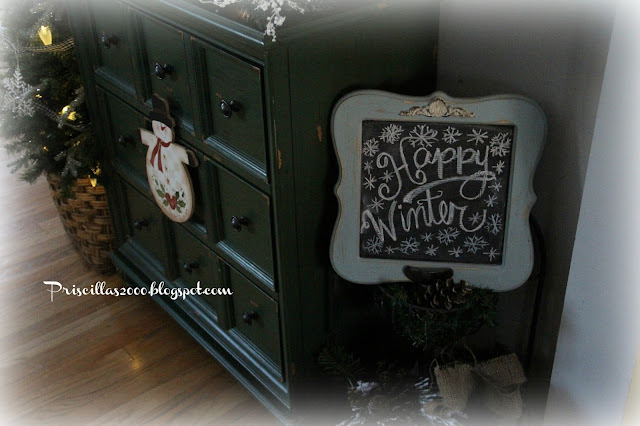 There is a winter chalkboard on top of the hutch with a flock of chickens and greenery .. I keep moving the galvanized tiered tray between the table and the counter .. which do you like best? 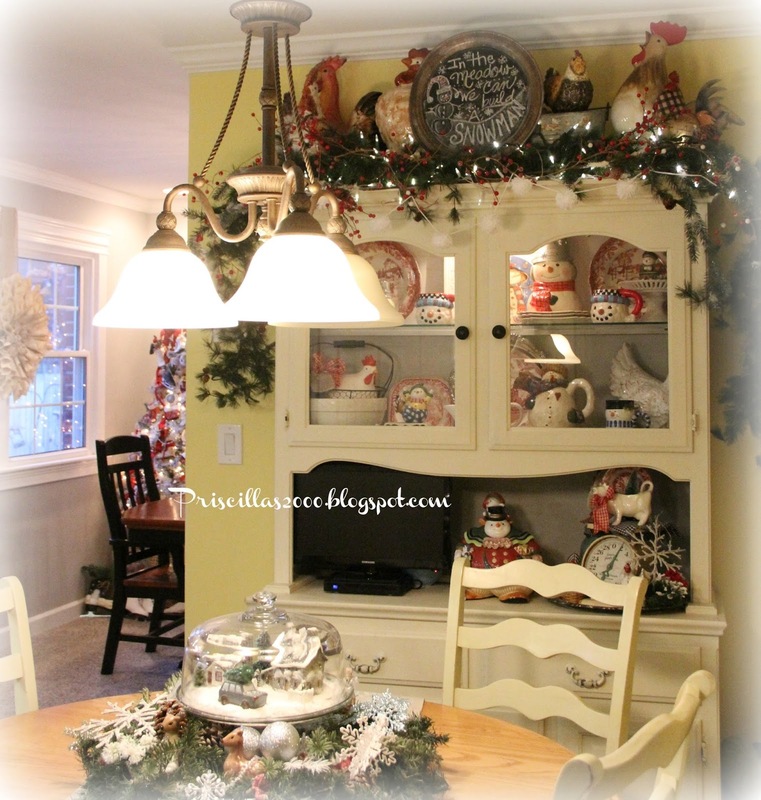 Two years ago when we did a little remodel I painted my kitchen hutch ( after I tried to sell it on Craig's list and had no takers !) 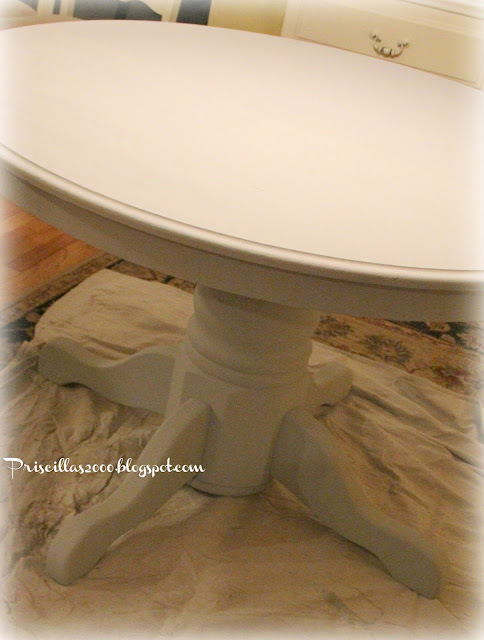 My kids didn't even want it for free :) A little homemade chalk paint and I love it ! 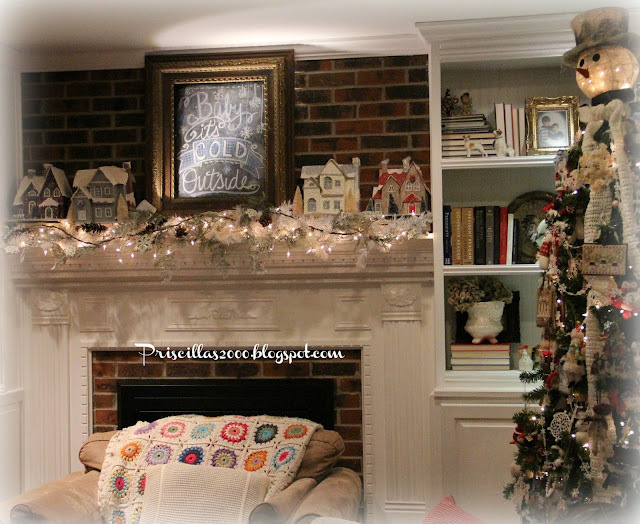 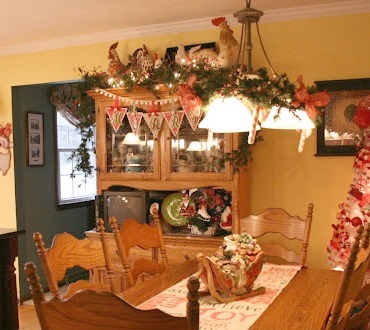 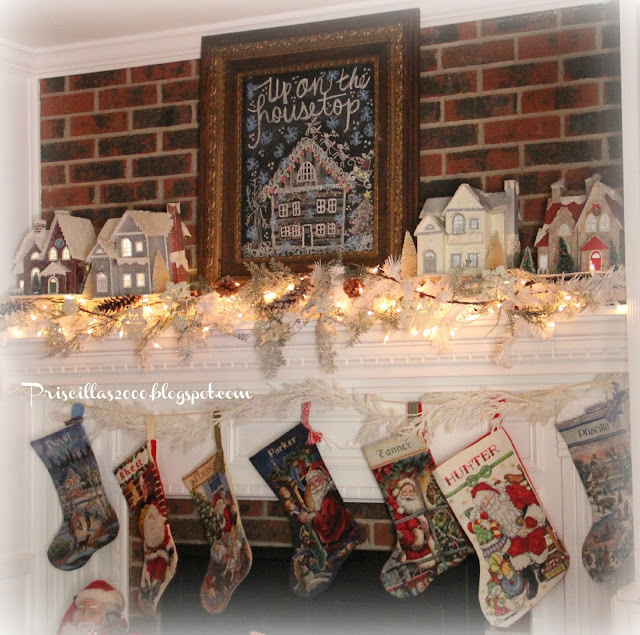 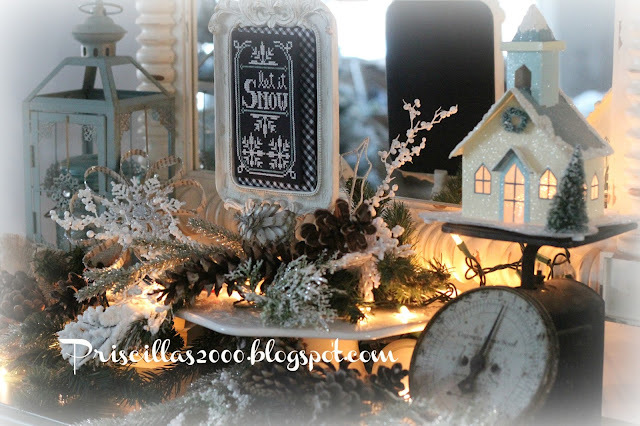 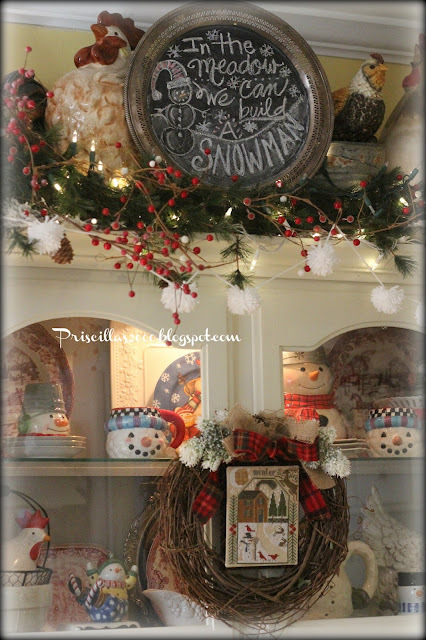 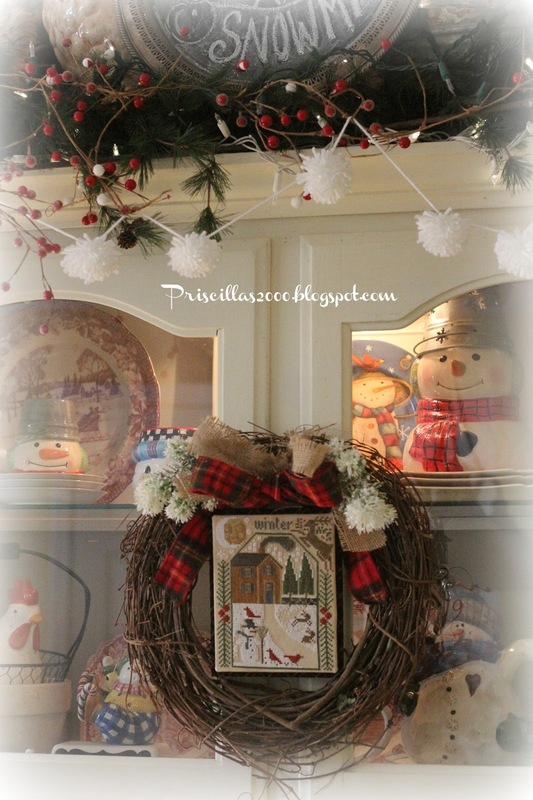 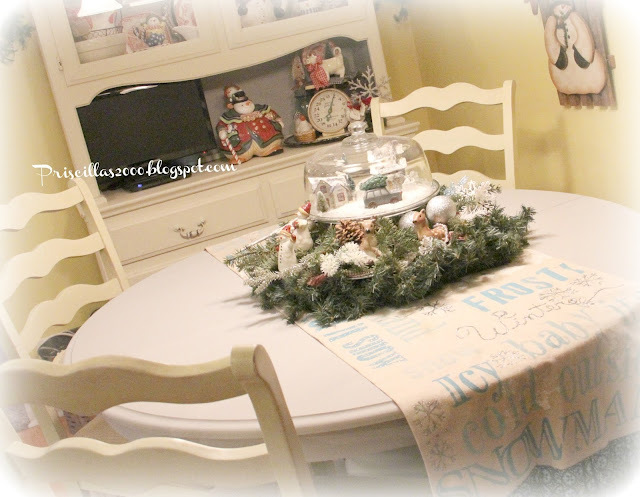 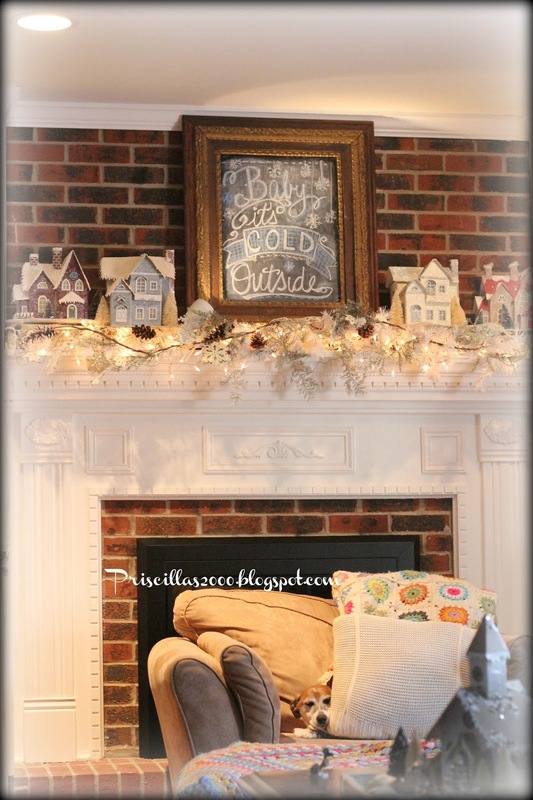 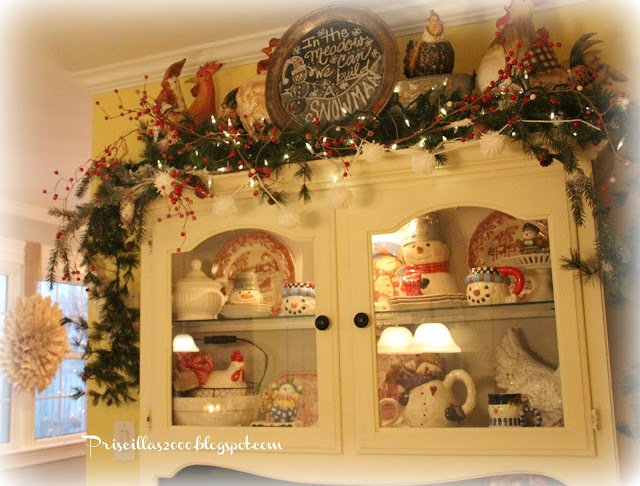 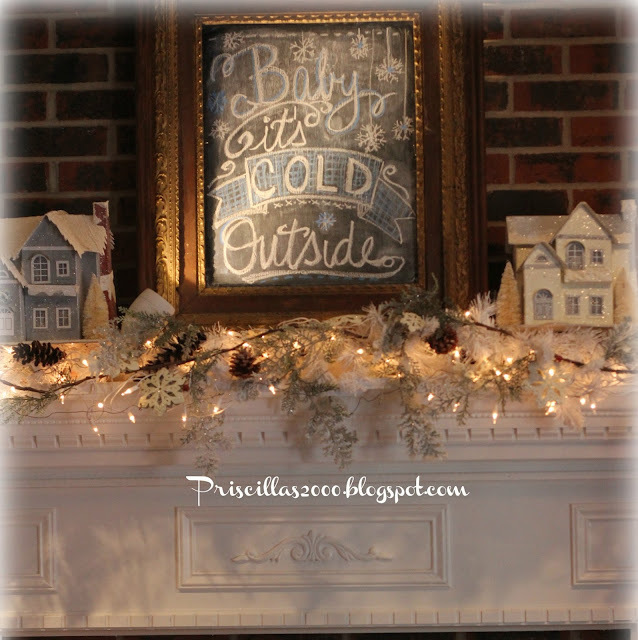 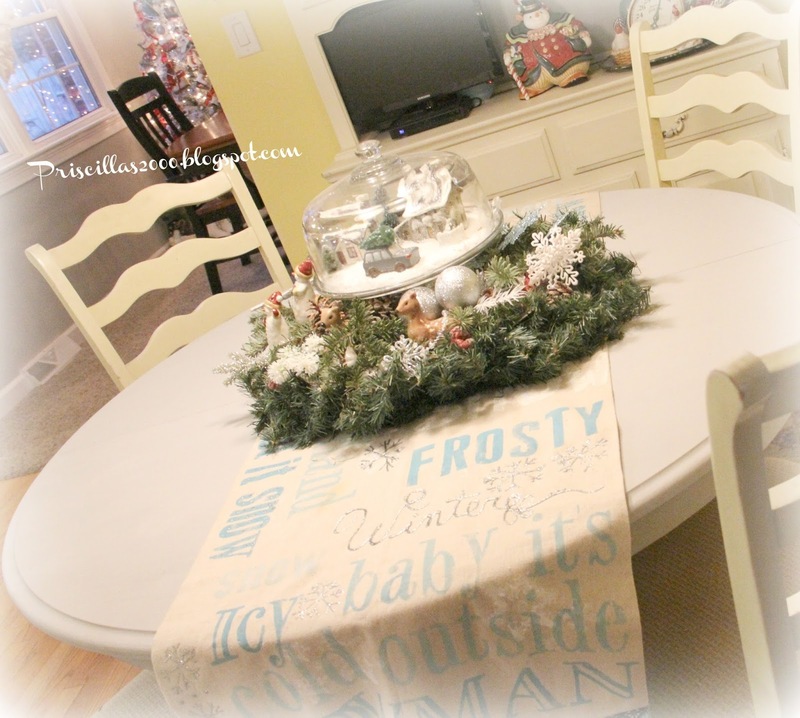 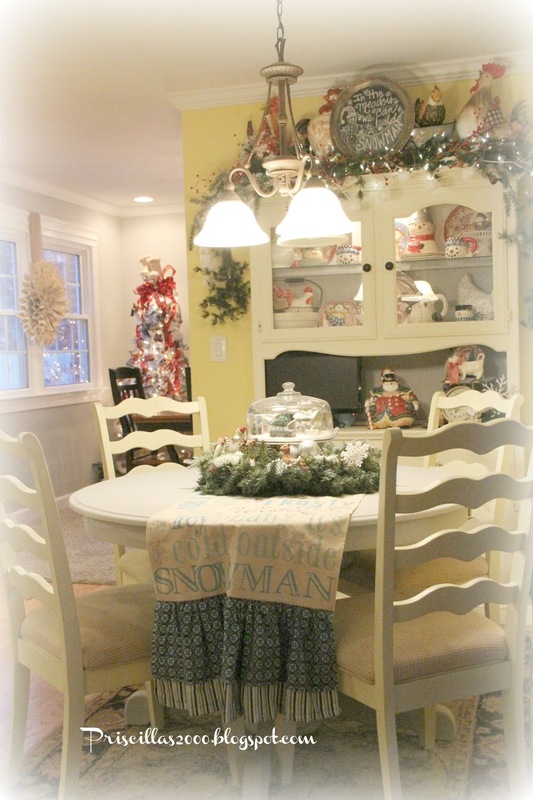 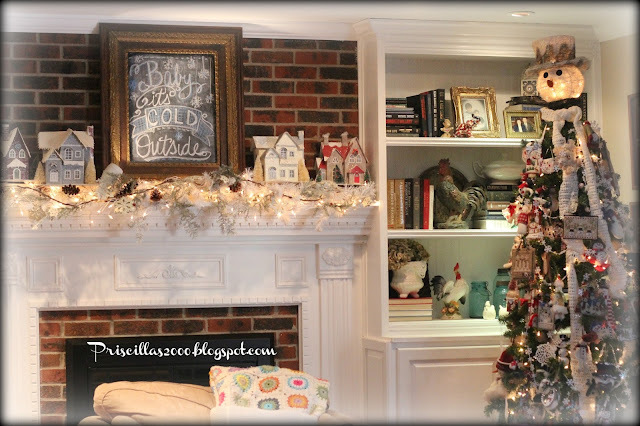 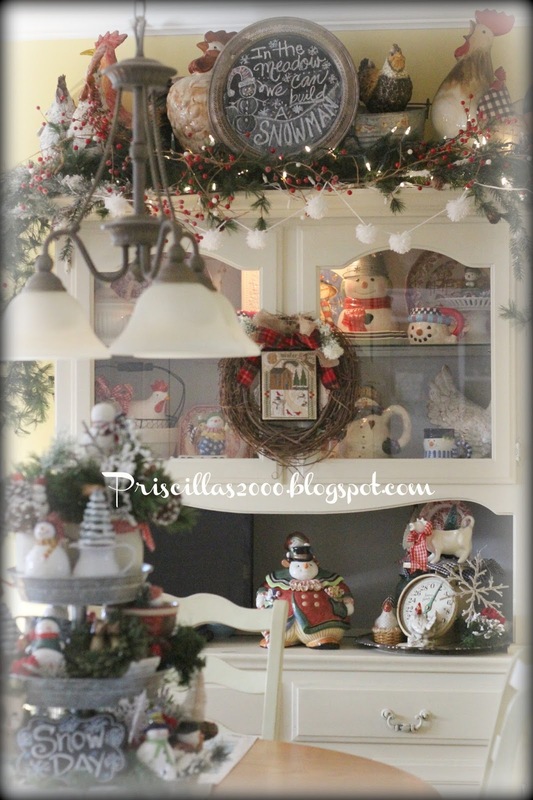 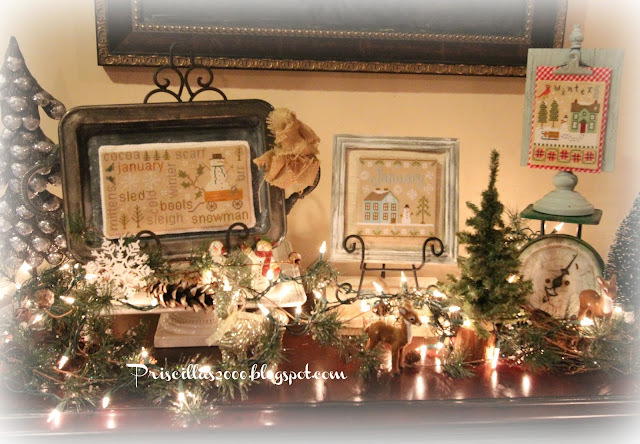 It is another of my favorite places to decorate for the seasons! 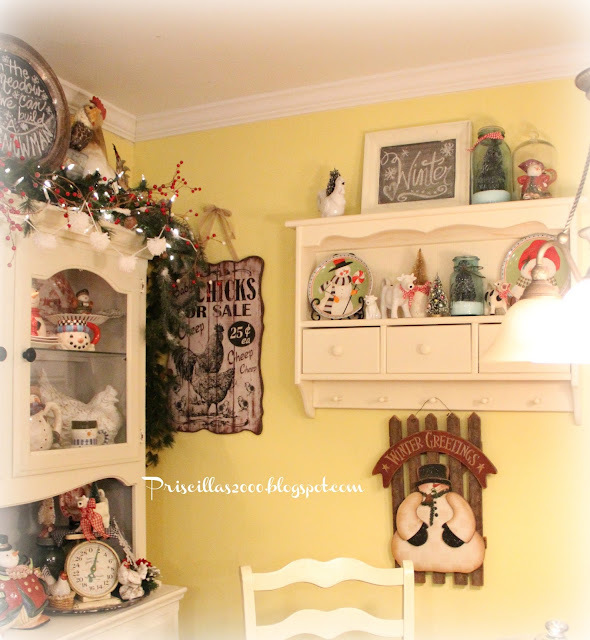 I am going to paint my kitchen table ..not liking the oak at all .. trying to decide the same cream as the hutch or the grey I used inside the hutch .. 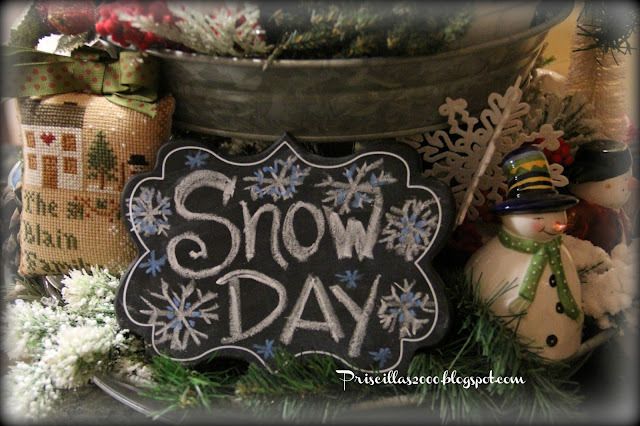 Hoping to get that done in the next week! 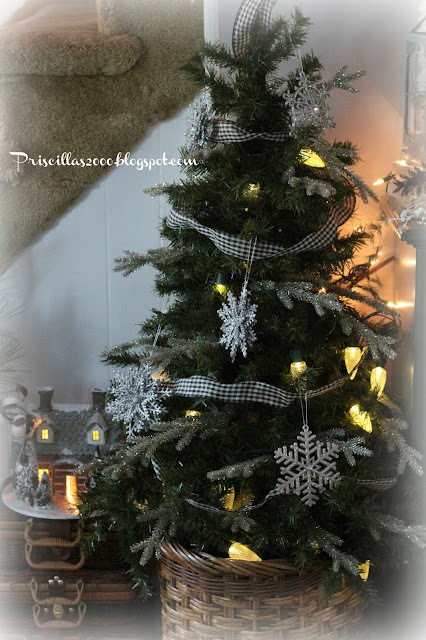 So what do you think ? 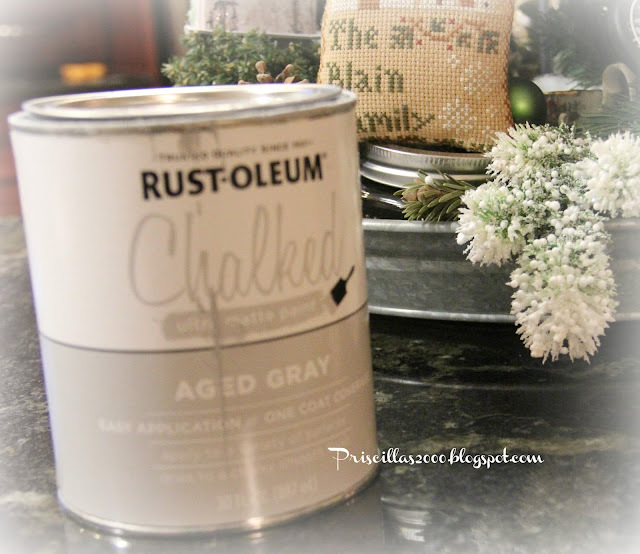 Grey or cream ? Much better now! 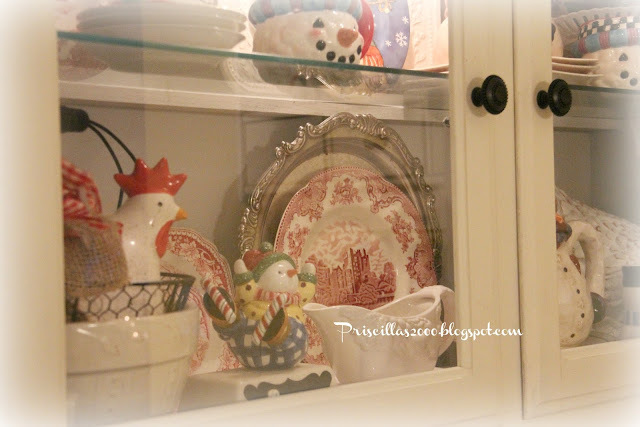 I filled it with snowman ..snowman plates , transferware with a winter scene and of course some chickens ..Those Little snowman cups were 99 cents at the Goodwill .. 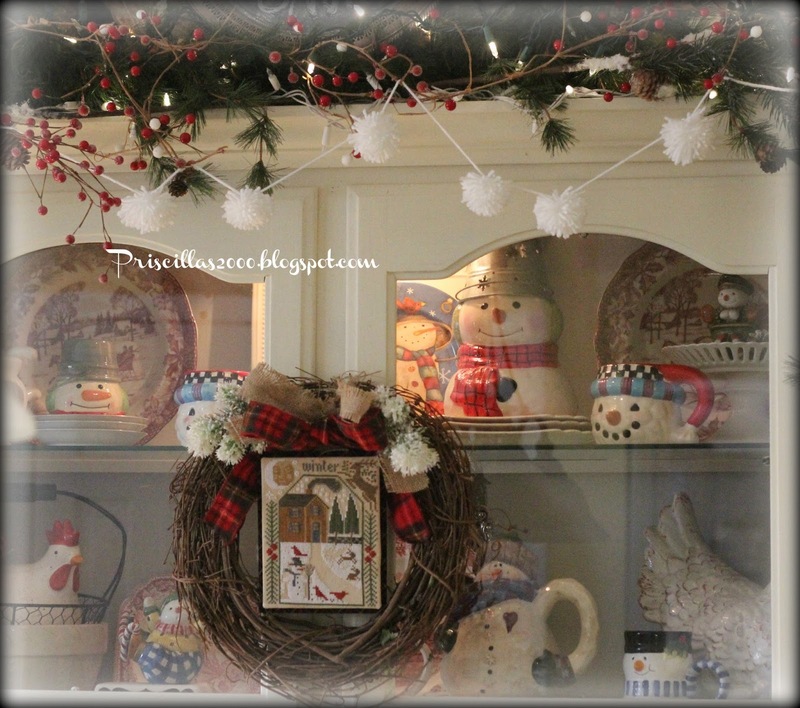 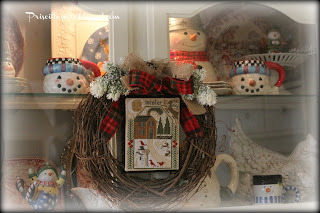 I also keep moving that Winter stitchy wreath between the hutch and the wall .. 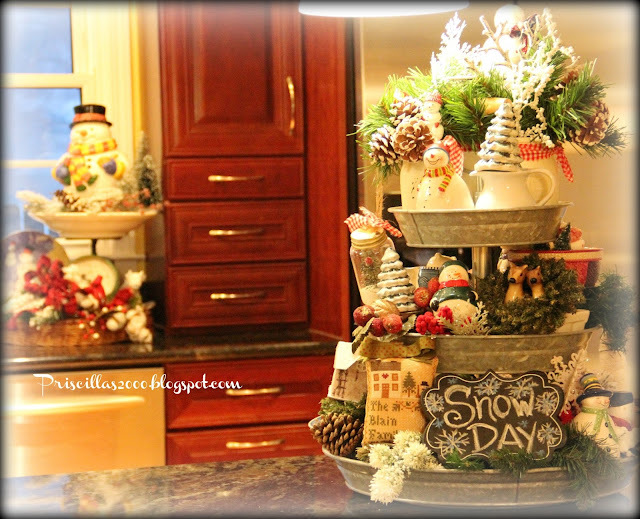 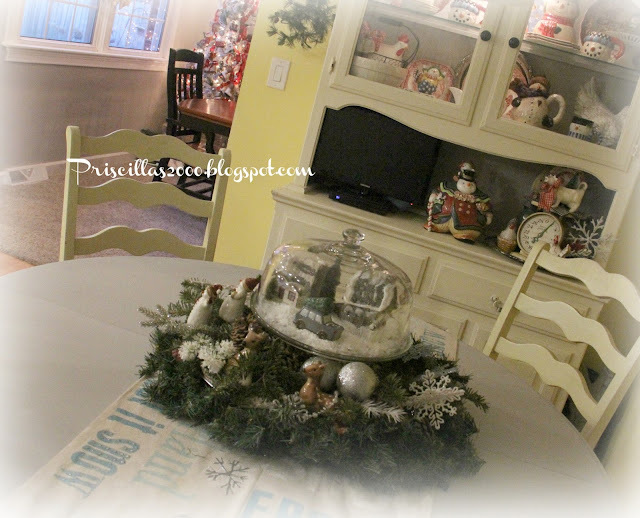 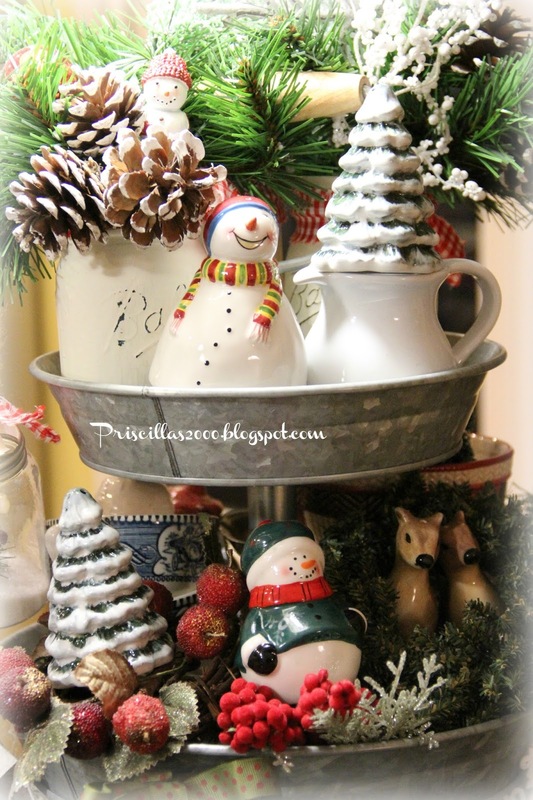 The galvanized tiered tray ..another favorite seasonal decoration spot..okay all the decorations are my favorites! 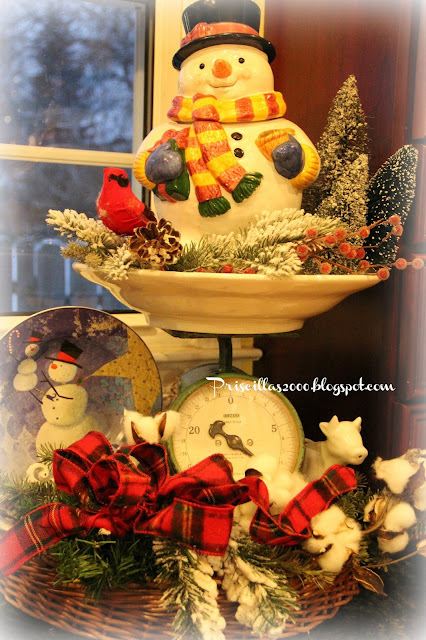 Love all the cute snowmen! 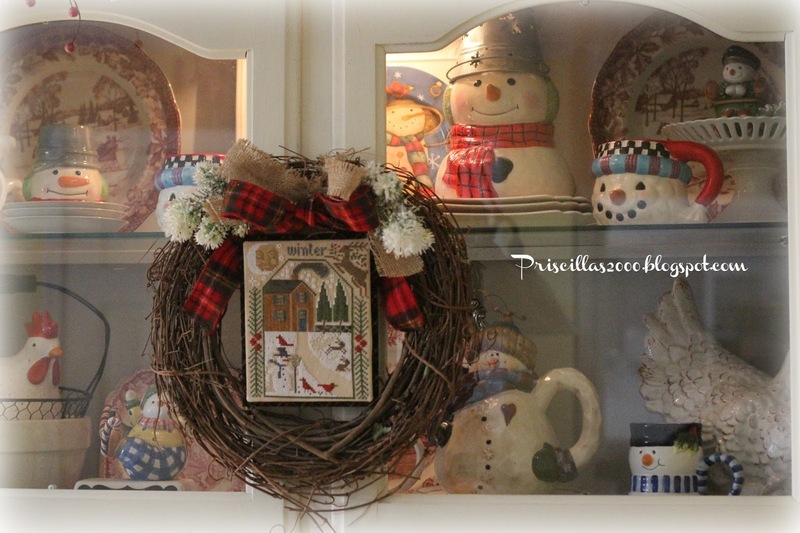 For the past couple years the snowmen have not come out with the Christmas decorations ..I save them for January and February .. 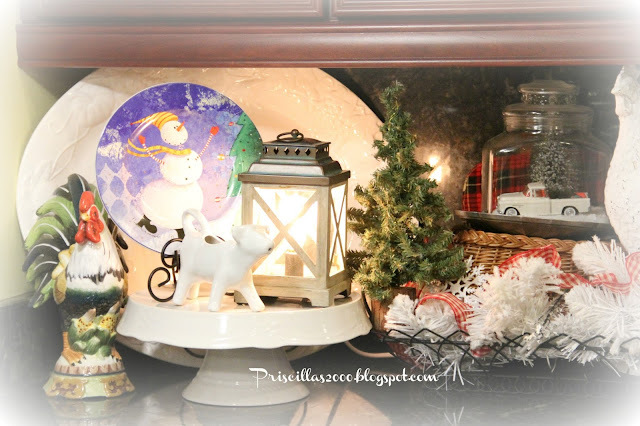 This vignette has one of my vintage scales , a snowman plate and cookie jar ..another cow creamer ( they keep multiplying ! ), bottle brush trees, plaid ribbon, faux cotton branches and snowy greenery ..I still have 3 trees up ..the ice skate tree that you can see here is in the dining room..the snowman tree in the family room and a little tree in the foyer..still loving all the Winter decorations!The Winter Seasons in Chalk hangs on the dining room wall connected to the kitchen .. 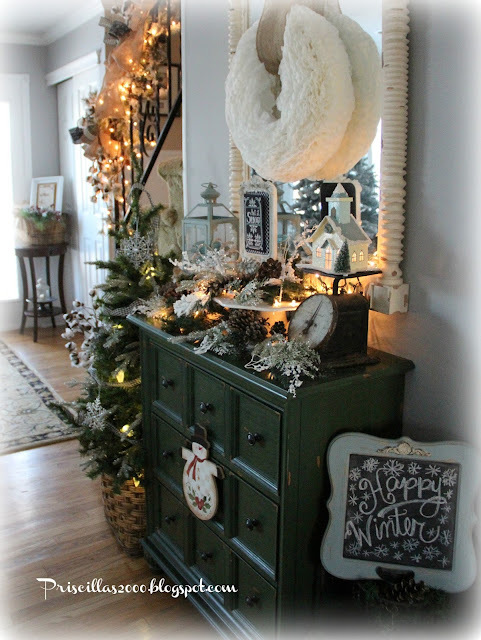 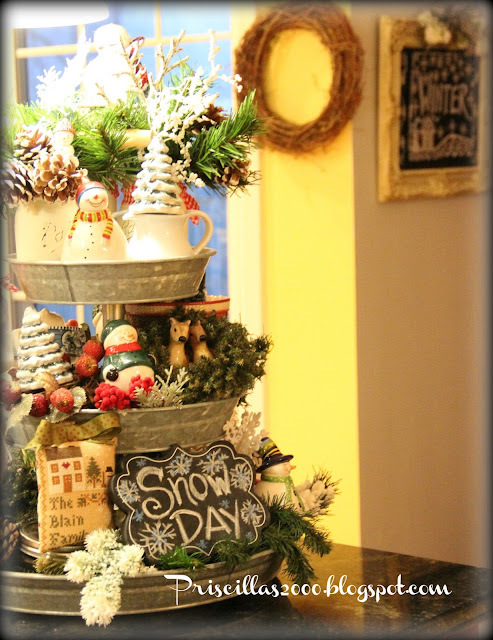 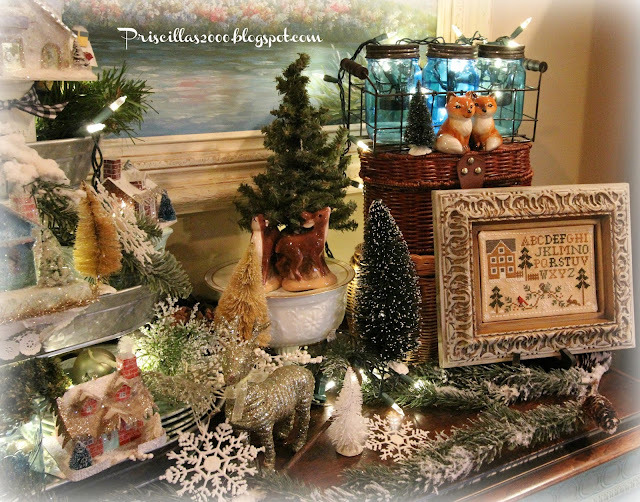 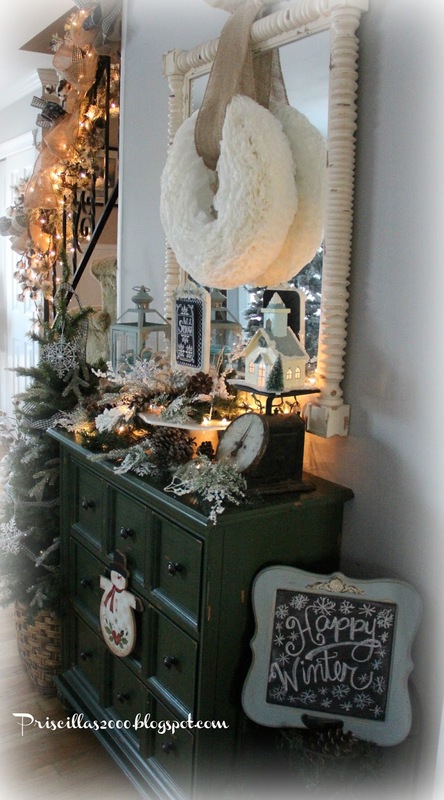 The foyer is filled with all things winter and I will take you on a little tour! I took the red ticking garland off this little tree and added some glittery silver snowflakes , silvery glitter branches , and black check ribbon.. 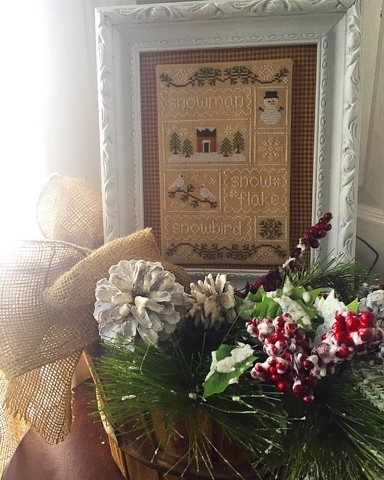 The January Year in Chalk cross stitch sits on the green cabinet on top of a white pedestal cake plate. 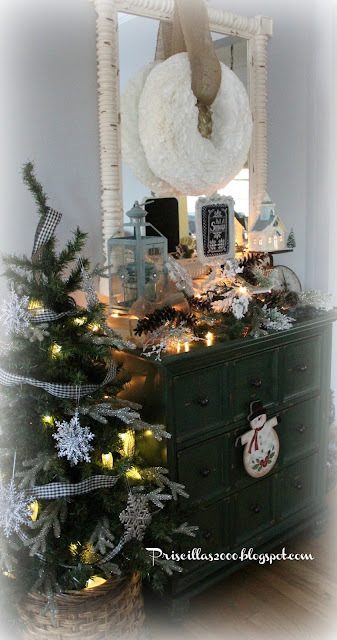 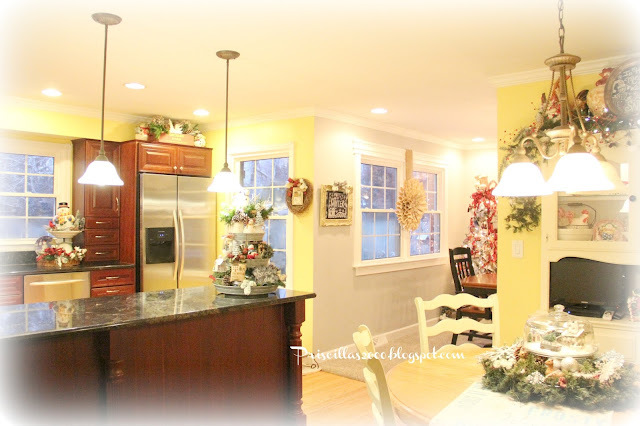 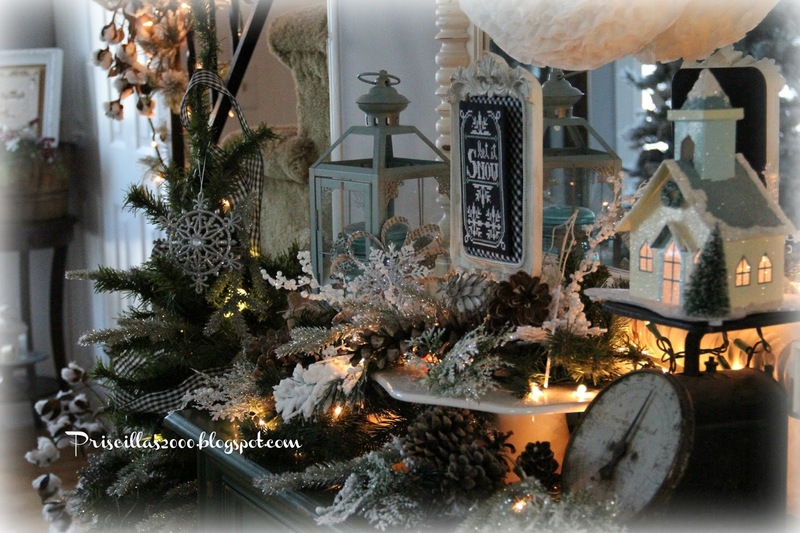 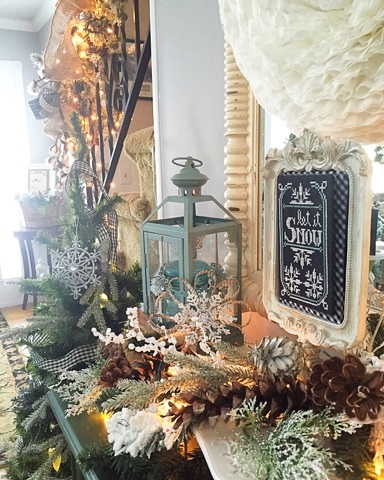 white and frosty evergreen branches , white lights and pine cones fill up the cabinet top.. 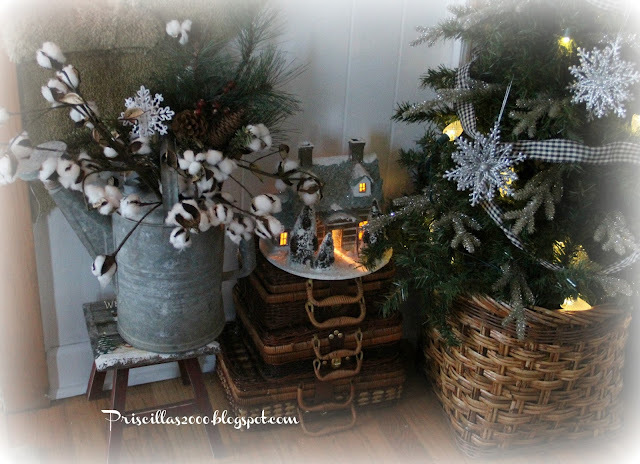 The stairs have white lights , burlap , black check ribbon and faux cotton branches..A DIY coffee filter wreath hangs over the cabinet..
Country Cottage Needleworks Snow sampler sits by the front door in a flea market basket surrounded by winter greens and berries with a big burlap bow..
A vintage galvanized watering can sits on a wooden stool ..filled with faux cotton branches and evergreen picks.. A stack of thrift store picnic hampers holds this lit Putz type house..
My first stitchy finish of 2016! Prairie Schooler Prairie Seasons finished into a wreath .. 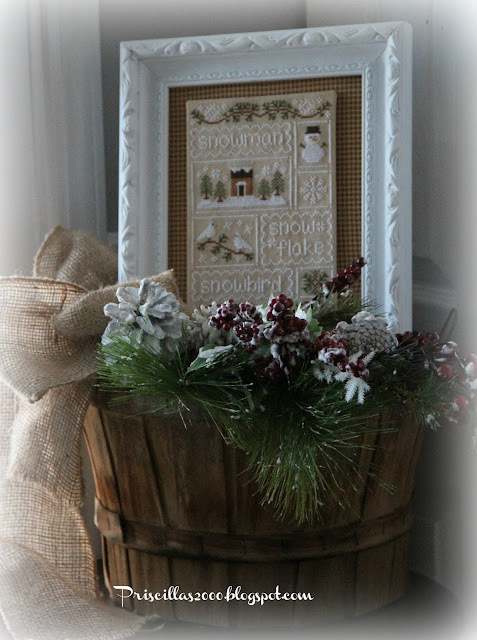 I used burlap to hang it from the wreath and added a plaid flannel bow and some frosty evergreen picks..
Last year I finished spring ..summer and fall this same way ..so I am excited to finally have this one ready ! 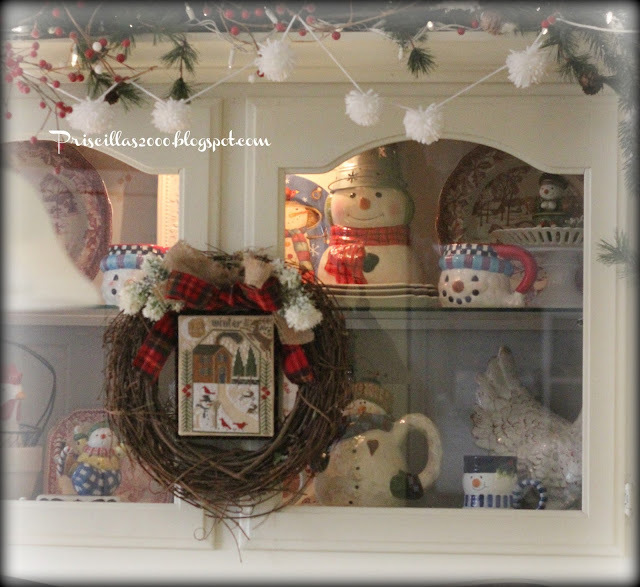 Right now it is hanging on my kitchen hutch , that is full of snowmen..